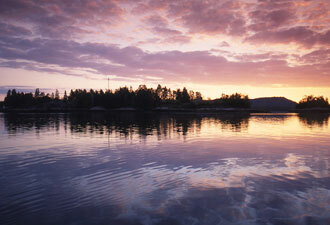 Saint Croix Island International Historic Site is “downeast,” as they say in Maine. That's down wind and east of Boston in old sailing lingo. Why not adventure? If you're planning a trip to Acadia National Park, Saint Croix Island is only 2.5 hours north—a mere day trip—along Maine's coastal Route One. This small site shares a big history, commemorating the beginning of permanent French presence in North America. In 1604―before Jamestown, before Plymouth, before Quebec City—Samuel Champlain, navigator and geographer, and expedition leader, Pierre Dugua, decided that Saint Croix Island was perfect for their settlement, out of sight from English eyes and close to the native people for trading furs. October arrived and with it the first snow. It was a grueling winter for Dugua and his men. Cut off from the mainland by dangerous ice flows, their fresh food, water, and firewood dwindled. That winter nearly half the crew of the 79-man expedition had died. The following spring, Passamaquoddy people traded fresh game for bread; the health of the remaining expedition members improved. In June 1605, two months later than expected, supply ships arrived from France along with new recruits. 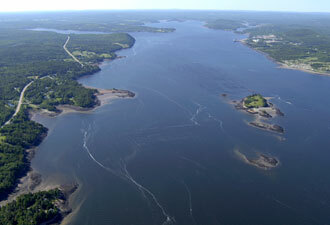 The settlement was dismantled and moved across the Bay of Fundy to Port Royal, in today's Nova Scotia. Here, from the hard lessons learned from Saint Croix Island, grew an enduring French presence on this continent. The island, nestled in the middle of Saint Croix River which forms the international border with Canada, is a mere 6.5 acres. It's a fragile and sacred place. It's from the mainland portion of this historic site that you can explore its history. Stroll the mainland interpretive trail, where bronze statues of French settlers and Passamaquoddy people help you imagine the Saint Croix Island story. At the end of the trail, find a seat under the interpretive shelter and enjoy an intimate view of the island. Here, from the shore's edge, you can witness the ebb and flow of the dramatic 20-foot-plus tides. The renowned giant tides of the nearby Bay of Fundy create an ever changing coastline. Peek into the future by one hour as you admire Canada on the opposite side of Saint Croix Island (Canada is on Atlantic Time; Maine is on Eastern Time). Travel tip: Pack your passport so you can view Saint Croix Island from both countries and learn about this shared chapter of Canadian and American history. 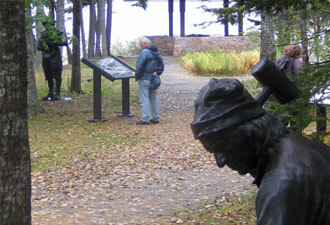 Parks Canada maintains a self-guided interpretive trail that offers a different view of Saint Croix Island. Pack a lunch and enjoy this quiet nook on the dynamic Maine coast. As you munch on your lunch, watch for bald eagles, osprey, and merlins soaring overhead, or keep a sharp eye out for harbor seals, cormorants, and loons playing in the river. Travel tip: Pack your binoculars! Inside the new ranger station, discover exhibits, a great selection of books, and a display of Passamaquoddy baskets crafted by local master birch-bark artists. While the kids earn their junior ranger patch by completing fun activities, why not join a ranger for a short walk or demonstration? Participate in a hands-on explanation of the tides; touch cast replicas from archeological digs and learn how artifacts reveal the past; hear quotes from Champlain's 1604 journal. Programs and park admission are free!